In the spring of 2009, I formalized my training by becoming a student after years of watching my children grow under Master Topp’s Instruction. The more I began to learn and actively use what I was learning the more time and energy I wanted to invest in understanding The Martial Way. It wasn’t until after I began my training that I realized that this is what had been missing from my life! This is what I needed to bring my life together. Finally I found my calling in life! This same year I also began training in A.T.A.C (Armed Tactics and Combatives). Beginning in 2010, I entered the tournament circuit taking on the challenge of local competitions as well as traveling throughout the state to test my skills. Collecting much more than just trophies, I learned real world lessons from each experience and better ways to apply my training. Also in 2010, I began to study the Iaido Sword Art under Master Topp, broadening my martial skills. I have always enjoyed teaching and throughout my life it was my nature to help and guide others. In July of 2011, I began to choreograph for student demonstration groups. We have had much success in both private dojo and public performances. In November 2012, it was an honor to be named as an Assistant Instructor of Jukido Kai Iaido. I am also proudly one of Master Topps “Black Shirts” in his Self Protection training courses. In 2013, I began the study of Aikido. 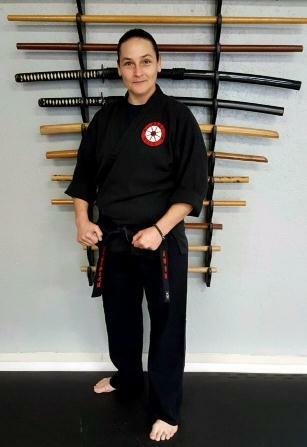 Although many of the other classes involve a lot of Aikido techniques, it was my desire to connect all of the arts by training in the “Harmonized Way”. January of 2014, I began instructing Kata class and assisting in the instruction of the Youth and beginner Karate programs. My love of the Martial Arts grows the more that I train and the more that I learn, and instructing helps me pass my passion on to others. I have been a first response provider in my active day job as a Team Leader at a local manufacturing facility. I am certified in CPR and first aid.